I've just come back from KL the night before. I'm still tired, not enough rest and still sleepy. I went to bed around 10pm and woke up 5:30am. The race will start at 6:30am and that doesn't leave me much time to fool around eventhough the distance from my home to the stadium is just around 10mins. Luckily all my gears, I've prepared it early. I arrived at the stadium around 6:10am - 20 more mins. I did a little bit of stretching and a warm up run. Antah macam mana, sakit tia jua perut ani, terpaksa lah mencari tandas and the time is 6:22am. pembuangan express. Exactly at 6:30am the race start and it was a mass start where all categories went off at the same time. It was a last minute change of plan and there were a few runners left behind because there were still doing their preparation (meditation, stretching, warm-up, melabur and antah apa lagi). 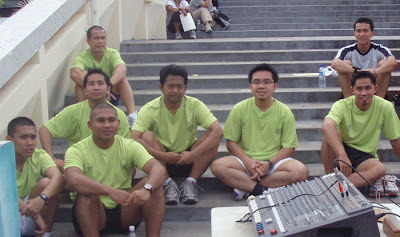 So when they heard that all the runners have run, they don't have any choice, pakai turbo lah to catch up with us. 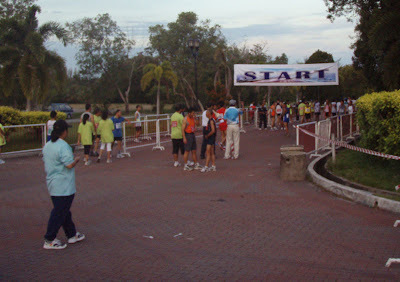 The starting area - Budiman Walk. Sambutan kurang memuaskan as you can see from the pictures. Its almost starting time and the area is still not fill up. 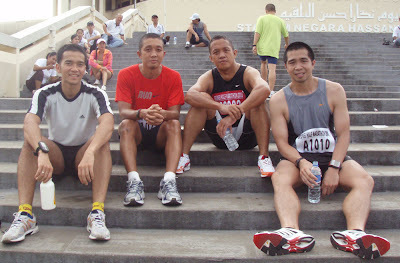 From the news, only 137 runners registered for the event. 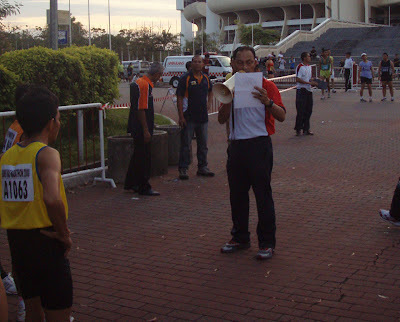 From the stadium right until Bukit Supa Save, I was with Rafidi and after that I ran alone because he speed off to catch other faster runners. My running engine is still not fully awake. Kan laju pun inda mau. My legs feel tired. At the second hill - MOF Hill, barutah ada speed and speed up along the hill. After 48 mins, I recharge with Powerbar Gel and top up with pure 100% water ------> zoom my energy fully recharge and increase my pace.I managed to catch up with Rafidi - around 600 to 700 m apart. I took my 2nd powerbar gel at the last water checkpoint, just to make sure that I will have enough energy to reach to the finish line. The finishing wasn't that great due to the reason there was nobody to beat in the last few meters. So ada boring lah sikit. 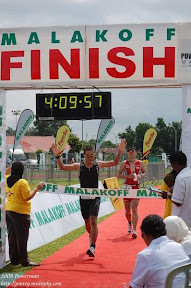 But the good thing, I managed to break my personal record of 1:59 eventhough I didn't achieve my target of 1:55. Be greatful what you achieved.